This Mexico tour has been designed for those adventurous travellers who wish to discover the true wealth of the Mayan Riviera. It has the perfect balance to enjoy the wild Mayan nature, admire the beauty of the turquoise colours of the sea, canals, lagoons and cenotes, lie down under the Caribbean sunshine, visit beautiful archaeological sites and learn about the Mayan ancestral culture, from the extraction of organic chewing gum, to agave threading or listening to Mayan storytelling. Discover the little known community of Takkbil’Ja, where you will be able to dip into a cenote and a swim in a subterranean river. Explore the archaeological site of Cobá, and admire the incredible sunrise in Tulum. 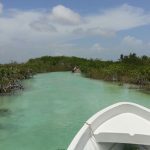 Navigate an ancient canal that goes through four different ecosystems in Sian Ka’an Biosphere Reserve. You might even see manatees! Snorkel in a beautiful open cenote or even better, take a scuba diving excursion, to be amazed by this underwater world. Go into the jungle to extract chewing gum from trees, and learn how to make thread from the agave. Learn about organic gardening, visit a typical Mayan house and in the evening, listen to Mayan tales. Spend 2 wonderful days in Bacalar and its famous “Lagoon of seven colours”. Enjoy kayaking and take a catamaran for a fun day out in the water, to reach a cenote in the lagoon! Visit one of the most important jaguar reserves, Calakmul, and its archaeological site. This is a private tour and you will be accompanied by an English-speaking local guide and driver throughout, in a private vehicle. All activities and excursions in this Mexico tour are private (only for you). The price displayed is per person based on two people sharing. All tours can be tailor-made to suit your interests and requirements. 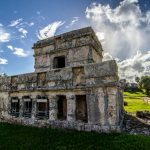 This tour has been created to allow adventurous travellers to get to know the Mayan culture of Mexico. It gives the traveller a taste of how the local communities live, the ancestral Mayan culture, traditional rituals, incredible nature and impressive archaeological sites. 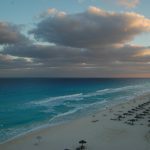 The tour starts in Cancun, where you will stay in a charming hotel to have a rest from your flight and get ready before you venture into the wonderful Mayan world. You will visit the community of Takkbil’Ja, a new project where you will experience a homestay with a local family. This small community of 245 people, has created a community school and are guardians of 22,000 hectares of natural reserve. 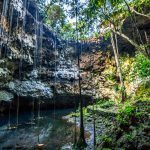 In this community you can plunge into the waters of a less known cenote, and a subterranean river. The following day, after having lunch in Nuevo Durango, you will visit the archaeological site of Cobá. This a lovely site, as it is surrounded by trees, and it is located by a beautiful lagoon. You will walk or bike on the white paths that will lead you to the main pyramid, Nohoch Mul. After this, to your lovely hotel in Tulum. You will visit Muyil on the following day, to experience the wonderful Sian Ka’an biosphere. If we are lucky, we will be able to see manatees in one of the four ecosystems we will cruise through, on the ancient canal. It truly is wonderful to see the turquoise shades of blue combined with the green jungle in the background. Have you ever seen the sunrise in an archaeological site, with the sea in the background? It is an amazing experience and you are going to experience it here in Tulum. Afterwards, we’ll visit a beautiful open cenote where you will snorkel, or if you fancy diving, you will be able to do so in this scuba diving paradise, or even take a Discover Scuba Diving course! Each cenote you visit is formed differently, and the refreshing feeling of getting into fresh crystal clear water will be amazing, with the heat you will experience in Yucatan! Afterwards, meet a charming family in the community of Chunhuhub. 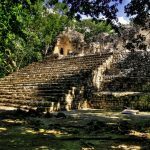 Here, you’ll learn to extract chewing gum from trees, create thread from the henequen, visit an unknown cenote and learn about their life story, and Mayan myths and legends. You will fall in love with the lovely family, who will be your hosts for 2 days. We say good-bye to Chunhuhub to enter yet another paradise: Bacalar. Bacalar is famous for its Lagoon of 7 colours. This amazing lagoon has a cenote inside, which you will be able to reach with your fun catamaran and your guide on day 2 of your stay there. After these 2 relaxing days, let’s go for a bit of jungle!! Our next stop: Calakmul. 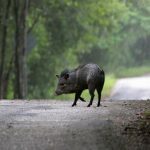 In Calakmul, you will take your pack lunch and take the road to see one of the most important jaguar reserves and at the end of this track awaits the archaeological site. Amazing photographs can be taken at sunset. Welcome reception at Cancun airport and transferred to your well-located hotel in Cancun. On the way to your hotel our guide will give you all the tips and recommendations to get the most out of your trip in Mexico - and answer any questions you may have. Free rest of the day to acclimatise after your flight. Optional: If you prefer you can stay in Playa del Carmen beach tonight (approx 1 hour from Cancun). Free morning to enjoy the beach of Cancun. Around noon, transfer to the Mayan community of Takkbil’Ja (approx. 1 hour), where you will arrive for lunch and experience a homestay with a local family (this is a new project and still rather unknown). 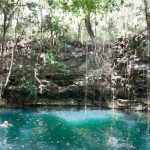 In the afternoon, swim in a natural cenote (sinkhole) and trek in the natural reserve, and if we are lucky we can see a family of monkeys that live nearby. This community (composed of 245 people) has created a community school and are guardians of 22,000 hectares of natural reserve. Free evening. After breakfast, get ready for a swim in a subterranean river. To avoid causing damage to the ecosystem, do not wear sunscreen, creams or lotions of any kind in the water! We will have lunch with a lovely family of Mayan community of Nuevo Durango (at 20 min from Takkbil’Ja). After lunch, transfer to Cobá (approx. 45 min) for a visit of the archaeological site of Cobá, surrounded by beautiful lagoons and trees. Here you can learn about this important site, whose design and purpose was very different from other Mayan cities. The white roads lead from each settlement to the main pyramid, Nohoch Mul. Transfer to the town of Tulum (50 minutes), to check into the charming hotel. Free evening. After early breakfast, you will be picked up from your hotel in Tulum, to go to Muyil. You will get to the community centre and get ready for your activity today. You will take a boat to discover an ancient canal that goes through four different ecosystems. Hopefully, you will be able to see manatees! We will go to the beach, where you will have time to have a swim, and you will be able to have a swim on the canal, too! After this, you will have a regional lunch and if you fancy it, you can visit the community museum. Back to your hotel in Tulum. We recommend you go to bed early today, for an early start tomorrow! Today, we will leave before sunrise. Why so early? Because seeing the sunrise from the archaeological site of Tulum is an amazing experience that not many people know about. Also, the site will only have a few people around (if any). Back to the hotel for breakfast. After breakfast, we transfer to a beautiful cenote (sinkhole) located 5 Km from Tulum, where you will be able to snorkel in its clear waters (this activity could also be a Discover Scuba Diving course for those who wish to initiate in this wonderful sport, or a scuba diving activity for those who are certified). The Mayan Riviera has many of these beautiful natural caves with crystal clear waters. Around noon, we will head towards the community of Chunhuhub, and on our way, we will make a stop in the village of Felipe Carrillo Puerto (approx. 1 hour) to enjoy a delicious Yucatecan regional lunch and continue our way until we reach our lovely Kiichpam Kaax ecolodge in Chunhuhub (approx. 1 hour). Free afternoon and evening. Dinner will be served at the ecolodge. 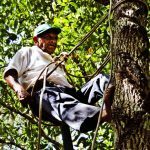 Today we will wake up very early in the morning, have a little snack and go into the jungle to see the process of extracting the resin from the trees, which is used to make chewing gum (season goes from June to October). We will learn about medicinal plants and the interesting flora and fauna around. When we are back from our trek, we will have our breakfast at the cooperative. We will visit the premises and learn about the melipona bees, how they are looked after, and their honey production. We will also be able to see a typical Mayan house, and learn about the community’s organic garden. If you are up for it, our host will take us to a little known cenote located 30 min away from Chunhuhub: Dzulá. After this, we will go back to our ecolodge to have lunch and have a rest. Later, we will be able to participate in a small workshop of sisal (agave) fibre and sit with the members of the community to get to know them and listen to myths and legends. Dinner will be served at the ecolodge. After breakfast, we transfer from Chunhuhub to Bacalar (approx. 2 hours). Have a day off in this lovely town to enjoy its famous Seven Colours freshwater Lake. After, check-in at the small charming hotel, where you will have kayaks at your disposal to go into the lake, which always has warm temperatures. 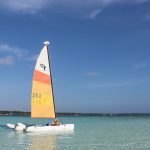 After breakfast, pick you up for a great sail on the lake for about 3 hours, on a lightweight catamaran. You will be able to go along this very large lake, discover its cenotes, and simply enjoy! Definitely, one of our favourite experiences. Rest of the day is free to nap on the hammock, swim or simply relax. After breakfast, we transfer to Calakmul (approx. 1.5 hours). Check-in at the hotel, take our box lunch and transfer to the reserve and archaeological site (the site is at 1.5 hours from the hotel). This site is far more photogenic in the afternoon than in the morning and the animals are more visible either in the early morning or late afternoon, so it is perfect timing to visit. We will go on a trek through the forest, where, if we are very lucky, we might see a jaguar, as this is one of the most important jaguar reserves. We will finish at the archaeological site, where you will be able to take amazing photographs in the sunset. Free evening back at the hotel. At scheduled transfer to Chetumal airport (approx. 2 hours) for your flight back home or continue your journey to Belize or Guatemala. End of tour. 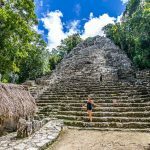 Accommodation: 1 night in a hotel in Cancun, 1 night homestay in Nuevo Xcan, 2 nights hotel in Tulum, 2 nights in an ecolodge in Chunhuhub, 2 nights hotel in Bacalar, 1 night hotel in Calakmul. No minimum number of passengers required. Prices quoted are per person and based on at least 2 people travelling. You should expect a cheaper price for bigger groups. This tour of Mexico has a low level of physical difficulty and participants can choose to do as much or as little as they like. Extra budget recommended: Food: Around £120 / $150 to cover meals (+ approx. 10% of the bill for tips) and £60 / $75 for snacks. What is included: Welcome reception at the airport. Overland transport (in a private car). Accommodation. Entrance fees to sites of interest, museums and national parks mentioned in the itinerary. Guided activities and excursions with English speaking guides (some private, some as part of a small group). Meals as stated in the itinerary (B= Breakfast, L= Lunch, D= Dinner). Contributions to the social projects visited. Tagged as active, adventure sports, archaeology, bird-watching, boating, cenote, cultural experiences, cultural heritage, ecolodge, family-friendly, indigenous peoples, jungle, Mayan heritage, Mayan Riviera, sightseeing, traditional gastronomy, unspoiled beach, wildlife, Yucatan.